On November 1, 2010 Cisco announced the End-of-Sale and End-of-Life for Cisco 2800 Series Integrated Services Routers which included the CISCO2811 ISR. Even though Cisco no longer offers the 2811, it doesn’t mean that you can’t obtain this terrific routing solution for your enterprise small business application. Read on to learn what performance features are available with the best-in-class Cisco 2811 Integrated Services Router and how you can purchase this routing solution. One enhanced network module slot. Two integrated 10/100 Fast Ethernet ports. Four high-speed WAN interface card slots increase system density. System interface will support an array of new and existing modules including AIMs, NMs, WICs, VWICs and VICs. System performance and modular design enhances the 2811’s investment protection. Wire-speed performance of concurrent and advanced services to multiple T1/E1/xDSL WAN connections. Optional features include Layer 2 switching support with Power over Ethernet. The internal power supply can be upgraded to provide in-line 802.3af-compliant Power-over-Ethernet and Cisco standard inline power. Performance and slot densities allow for integrate-as-you-grow expansion and advanced applications. Analog and digital voice call. Optional Cisco CallManager Express in local call processing applications for up to 36 IP Phones. Optional Survivable Remote Site Telephony in local call processing environments for up to 36 IP Phones. Hardware-based encryption acceleration integrated into the system’s motherboard. Embedded hardware cryptography accelerators provide wide area network link security and virtual private network services. Supports up to 1500 virtual private network tunnels when the Cisco AIM-EPII-PLUS module is utilized. Supports a host of secure networking features that include: Cisco IOS Software Firewall, Secure Sockets Layer, Multiprotocol Label Switching, USB eToken Support, AIM-Based Security Acceleration, Intrusion Prevention System and much more. Network Admission Control provides antivirus defense support. 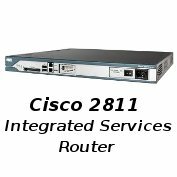 Sourcing a Cisco 2811 Integrated Services Router is easy and affordable at Maximum Midrange. Need pricing? 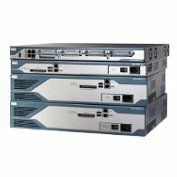 Visit our Cisco 2811 ISR page and tell us what your pricing needs are via our online quote feature and we’ll respond with affordable quoting that reflects your project requirements and budget. Call 855-932-6627 if you prefer to speak directly to our Cisco sales team about the 2811 router.